I love Pad Thai. Pad Thai is probably the reason why I started liking Thai Food. This might sound a little crazy, but I didn’t start eating Thai food until I was 21 years old. Nowadays, I actually rate Thai Restaurants based on the taste of the Pad Thai. 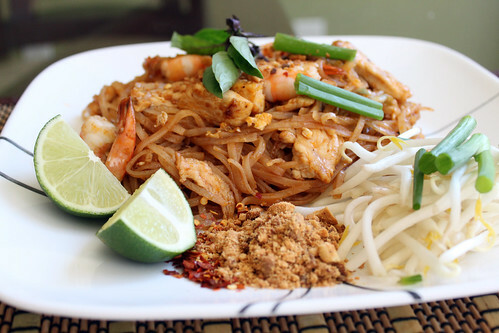 I’ve attempted to make Pad Thai at home, but usually used the over the counter Pad Thai Kits or used the pre-made Pad Thai sauces they sell at the Asian Super Market. Although it generally turned out okay, I just wanted to learn how to make it from scratch to see what is actually in it. So today, with the help of my wife, I decided to make Pad Thai from scratch – from making the sauce to the actual Pad Thai dish. For today’s dish, I got much of my inspiration from http://www.chezpim.com/blogs/2007/01/pad_thai_for_be.html and decided to play with the sauce recipe. However, after making the first batch of Pad Thai, Jane and I decided to play around with the sauce some more to make it less pungent and more suitable for our taste. 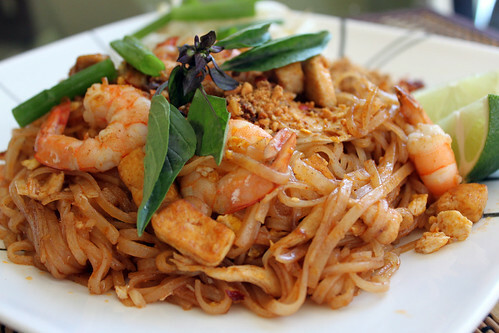 There are a few things that I learned when cooking Pad Thai today. First, it is REALLY IMPORTANT to soak the rice sticks in warm water for 30 minutes or more prior to cooking. If you don’t, you might get some uncooked rice sticks. This has always been one of my biggest struggles when cooking Pad Thai. Be patient and everything will be alright. Second, when cooking Pad Thai, it is important to keep the heat on HIGH (everything cooks pretty darn fast) and stirring the food rigorously is a must. If not, you can potentially burn or overcook your rice sticks and dish. Overall, this was a delicious dish packed with TONS of flavor. It is also very easy to make too so try it and let me know how it goes!